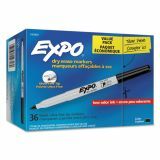 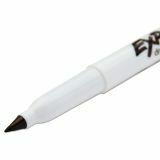 EXPO Low-Odor Dry Erase Marker Office Pack, Extra-Fine Needle Tip, Black, 36/Pack - EXPO Low Odor Dry Erase Markers offer the best solution for marking on whiteboards and most non-porous surfaces. These dry erase markers use a specially formulated, alcohol-based ink with virtually no odor. 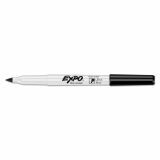 The EXPO markers feature vivid, quick-drying ink that is easy to see from a distance and a chisel tip that creates broad, medium or fine lines. The dry erase marker ink erases cleanly and easily from whiteboards and most non-porous surfaces with a dry cloth or eraser. 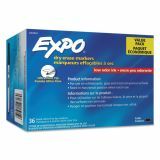 Use your EXPO Dry Erase Markers to track, schedule and present.